The Iowa Hawkeyes will close out their 2018 home schedule this weekend as the Lehigh Mountain Hawks will come to town on Saturday. Coming into this dual the Hawkeyes carry their unbeaten 5-0 (1-0 Big Ten) record while the Mountain Hawks will be in search of their first victory on the season. 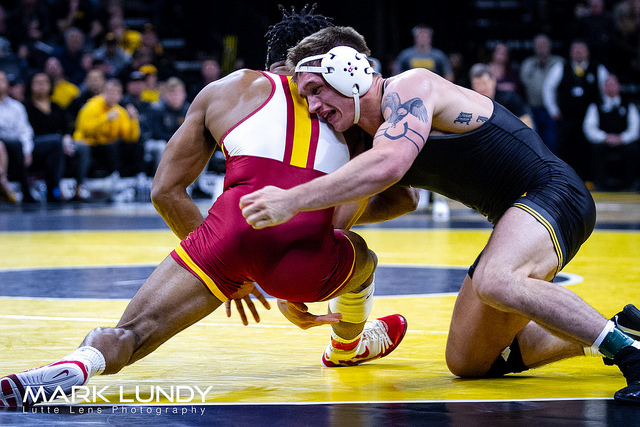 Last weekend Iowa narrowly got by Iowa State, 19-18 in their instate rivalry dual in Iowa City. This will be Iowa’s final tune up before they compete at the end of the month at the always tough Midlands Championships in Evanston, Illinois. But for all of Iowa’s trouble with fielding their lineup at full strength their weekend opponent doesn’t appear to be in better shape to this point in the season. Lehigh has yet to debut several of their big names this season, mainly Scott Parker (133) and #8 Ryan Preisch (184). The latter was actually listed in the Mountain Hawks probable lineup alongside Andrew Price, who has been filling in for Preisch thus far. The good news for Iowa fans is for this weekend’s dual the university only listed Spencer Lee (125) and Pat Lugo (149) as their probable starters at their respective weight classes, which hopefully means the duo are ready to return to form. Both wrestlers missed Iowa’s home dual against Purdue two weeks ago, and last week they were listed with Perez Perez and Carter Happel respectively. The assumption being that a week ago neither wrestler was a lock to return to the lineup, although both wrestlers appeared in the dual against the Cyclones. Assuming both sides are 100% healthy and ready to go this weekend, the Hawkeyes would find themselves favored in eight of the ten matches with four of the ten featuring a matchup between a pair of top 20 wrestlers. All four of those matchups will take place at 165 pounds and up. That means we should see Iowa dominate the lightweights as they will be favored in all five bouts spanning 125 to 157 pounds. The bad news for Iowa is that just one week after losing All-American Michael Kemerer to a season ending injury, his backup Myles Wilson went down with an injury of his own. Wilson was leading Iowa State’s Marcus Coleman 4-3 heading into the second period last weekend when his leg buckled and the wrestler fell to the mat. The team then had to injury default to the Cyclones. This weekend there was a new face listed in the lineup probables, junior Jeremiah Moody. After beginning the season at 157 pounds Moody will bump two weight classes to compete against the #6 ranked Jordan Kutler. Iowa did also list senior Mitch Bowman at 184 pounds, though we will likely see the former NCAA qualifier weigh in well under scratch weight. Shortly after the news regarding Kemerer broke IAwrestle confirmed the Bowman is in fact certified at the 174-pound weight class, though due to NCAA weigh cutting guidelines he will not be able to make it down until the Midlands before he is allowed to compete at the weight. The two weights fans have started circling heading into the dual would be the matchups at 184 and 285 pounds, though both matches may not come to fruition due potential health concerns. After dropping his match late last weekend to Sammy Colbray there is no doubt that Hawkeye junior Cash Wilcke would love to get back on track with a big win over the #8 ranked Preisch. As we mentioned earlier in the preview, Preisch has yet to make his season debut. The other top meeting could feature a top 10 matchup if Iowa decides to once again send out the #1 ranked Stoll to take on #6 Jordan Wood. Stoll made his season debut against Gannon Gremmel and won a controlled 5-1 decision. Other top 20 meeting can occur at 165 and 197 pounds where Alex Marinelli and Warner are scheduled to face #20 Cole Walter and #19 Jake Jakobsen respectively. The other interesting note is that Lehigh is located in eastern Pennsylvania, a state that has produced four of Iowa projected starters for this weekend’s contest: Spencer Lee, Austin DeSanto, Max Murin, and Kaleb Young. December 6, 2018 in Iowa Hawkeyes.